Derbyshire v Yorkshire T20 game at Queens park Chesterfield. derbyshire batsman Slater. 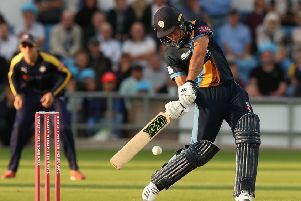 Derbyshire Falcons’ home Vitality Blast fixture versus Yorkshire Vikings on Saturday 28 July at Chesterfield has sold out for a second year in a row. The local derby continues to grow in popularity, with more people than ever purchasing tickets in advance to secure their place at the showpiece fixture of the Custom Solar Chesterfield Festival of Cricket, in association with Chesterfield Borough Council. It’s the third time in four years the Twenty20 fixture at Chesterfield has sold out in advance. Only matchday ticket holders will be able to gain entry into the ground on Saturday. Tickets will not be available to buy on the day. Chief Executive, Simon Storey said: “The local derby is always the highlight of our week in Chesterfield. The demand for tickets continues to grow year-on-year and we’re delighted to announce an advance sell out for a second year in a row. Councillor Steve Brunt, Chesterfield Borough Council’s cabinet member for town centres and visitor economy, said: “One of the reasons we help bring the cricket festival to Chesterfield each year is that the crowds who attend will stay at hotels in the area, use local restaurants, bars and other leisure facilities. “It is also an opportunity for local residents to see first class county players in the town and for local schoolchildren to meet the cricketers and be inspired to take part in sport and leisure activities. Supporters with matchday tickets are encouraged to plan their journeys in advance and give plenty of time to arrive at the ground. Gates will open earlier than advertised at noon.